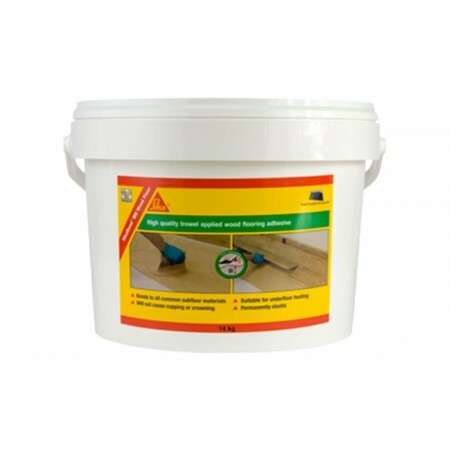 SikaBond MS Wood Floor is a high quality, trowel applied adhesive for bonding wooden floors to all common building substrates whilst remaining permanently elastic thus accommodating differential movement associated with changing climatic conditions. The formulation is completely water and solvent free thereby eliminating the possibility of wooden block/planks warping or cupping due to VOC’s. Always check moisture level of subfloor with suitable equipment and ensure that the moisture content is <2% CM or in the case of Gypsum based screed <0.5% CM. On cement based substrates where moisture levels are above 2%CM but below 5%CM install a liquid applied damp proof membrane such as Sika Primer-MB or SikaBond Rapid DPM. All surfaces must be sound, clean, dry and free from dust, grease or other contaminants that can reduce adhesion. 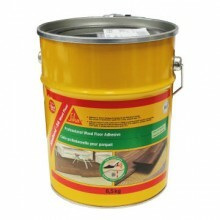 Existing floors must be free from all polish/wax. Residues of old adhesive not being isolated with Sika Primer-MB or SikaBond Rapid DPM must be removed mechanically as they may affect adhesion. Always check and record moisture content of subfloor. Basement/below ground floors must be adequately protected with a damp proof course and two coats of Sika Primer-MB or SikaBond Rapid DPM. 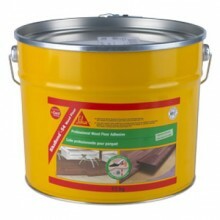 Further Preparation Turn off any underfloor heating systems 48hours before and 48 hours after applying the adhesive. Ensure that wood flooring is acclimatised in strict accordance with wood flooring manufacturer’s requirements prior to installation. Always check with flooring manufacturer re: any specific instructions/requirements specifically relating to their flooring before fitting floors. Always carry out installations and sub-floor preparation in line with relevant British or International standards. Do not spread more adhesive than can be covered within 20mins. Place wood in position whilst adhesive is still wet. Press firmly and evenly across the wood surface to ensure complete contact with the adhesive. Ensure you leave a 10-15 mm expansion gap along the walls and around protrusions to allow for the natural expansion of the wood. Use any opened material within 2 weeks. If a small skin is present under plastic disc of opened bucket, please discard and trowel remaining product as detailed. This will not affect the quality of the product. The temperature must not fall below +5°C or exceed +25°C during storage.